SpaceX tweeted this photo of the Falcon 9 rocket vertical on the launch pad on the morning of the day it planned to launch 6 Orbcomm OG2 satellites from Cape Canaveral, Florida, June 20, 2014. This story was updated at 7:20 p.m. EDT, June 22. SpaceX has pushed a planned commercial satellite launch back again, this time to Tuesday (June 24) at the earliest. The launch of six spacecraft for satellite-communications firm ORBCOMM was originally scheduled for Friday (June 20) from Florida's Cape Canaveral Air Force Station. An unexpected pressure decrease in the second stage of SpaceX's Falcon 9 rocket nixed that attempt, and bad weather foiled an opportunity on Saturday (June 21). SpaceX called off Sunday's launch try as well, apparently because of a glitch of some sort. "Today's ORBCOMM launch attempt has been scrubbed to address a potential concern identified during pre-flight checks," SpaceX representatives said in an update Sunday. "The vehicle and payload are in good condition, and engineering teams will take the extra time to ensure the highest possible level of mission assurance prior to flight." The satellites, which will be the first members of ORBCOMM's OG2 (short for "ORBCOMM Generation 2") constellation, are destined for low-Earth orbit. 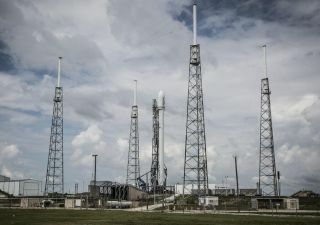 During the launch, SpaceX will also attempt to bring the Falcon 9's first stage back to Earth in a soft ocean landing, as it did during an April liftoff that sent the robotic Dragon cargo craft toward the International Space station. These efforts are part of SpaceX's plan to develop a fully and rapidly reusable rocket, which company founder Elon Musk says could revolutionize spaceflight and exploration.